I’m writing this from my newly acquired laptop, gifted to me by my husband to encourage my getting back into writing by being able to remove myself from our shared office (which is full of distraction), and it’s snowing for the first time this winter. It’s been unseasonably warm here in Maryland, keeping germs alive in an awful way and making Christmas feel not much like Christmas for me, so I doubt it will stick or amount to much, but at least it’s finally happening. Hopefully it won’t be the only snowfall we get this winter. Colder weather has always had a way of making my creative sides flourish. I’m not sure how or why they’re connected that way, but it’s always been the case. Where many people suffer from seasonal depression in the colder, darker months of the year, I find myself more productive and happier than I am all year. There used to be a time when that creativity presented itself in the form of baking, but in the past couple of years my treat baking has gone a similar direction as my photography – something I do on commission rather than for fun. But I miss the satisfaction of just baking something for fun, of taking an existing recipe and making it my own. And as I put my also newly acquired Kitchen Aid mixer (the most amazing wedding gift from my dear friend Akoss) to use this past week for a commissioned birthday cupcake order, I thought: I’m going to just bake for fun this weekend. It’s perfect that it decided to do my favorite thing of all, snow, when the free time to bake arrived. So, what did I decide to create? Well, this year I jumped ship from my usual Joyce Meyer devotional and decided to give a stranger’s devotional a shot instead. It’s not that I don’t still love Joyce Meyer or that her devotional wasn’t useful to me, I’m just looking for something more in my spiritual walk and while this new devotional isn’t exactly getting me there either, I think it’s healthy to take chances on something different, otherwise, how would you ever find what you’re looking for? Anyway, the new devotional is called Savor and it’s by a woman named Shauna Niequist and I hadn’t bought it for this reason, but every so many pages it comes with the added bonus of some of her favorite recipes. The first one showed up in between last weeks devotionals and sounded super promising and also like something I could easily convert to gluten free. I made a few adjustments to the recipe and directions (they’ll be shown in parenthesis and italics like this) and will likely make a few more the next time I make it, but overall I’m pleased with the end result and think it’s definitely something worth baking if you’re also looking to create in the kitchen just for fun. 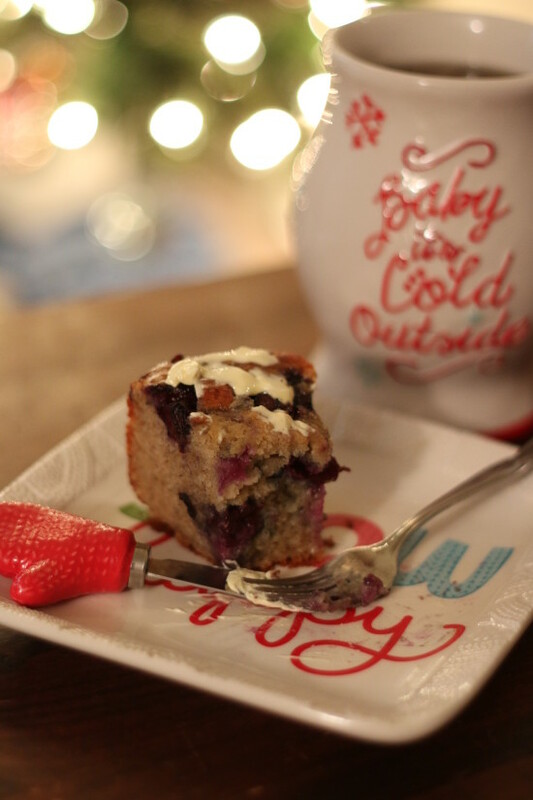 Shauna’s original recipe calls for…. In a large mixing bowl, combine butter, sugar, eggs, yogurt, and almond extract (and vanilla in my case 😉 ). Mix well. Add flour, salt, baking powder, baking soda, and mix by hand until combined and be careful to not over mix. (I didn’t mix mine by hand or find myself concerned with over mixing. In fact, mine still had a few lumps of butter and I think it worked out just fine. Also, I had added my cinnamon at this point.) Pour batter into the pan. Toss berries in remaining sugar (remember, this is where I split the sugar, part white sugar/part brown sugar) and then scatter them over the top of the batter. Bake for 45 to 55 minutes, or until a toothpick inserted in the center comes out clean. (My oven normally cooks high so I initially shot for the 45 minute timeframe, but in the end, it took 65 minutes for the center to finally set for me. This could be a result of the gluten free flour swap; it’s my first time substituting so I’m not entirely sure.) Let cool for 10 minutes, then transfer to a cake plate. I had my slice warm, with a swipe of butter on it, and a cup of tea, and it was delicious! In fact, I don’t think anyone who didn’t know it was gluten free would suspect so in eating it. It’s definitely a good comfort food for a cold, snowy day. 2 Responses to "Blueberry Morning Cake"
Aw, how sweet of him to give you a laptop to help you with your writing! Hope it results in a lot of productivity for you! And I’m glad you’re finally able to enjoy some snow! I remember you saying how it was warm enough for flip-flops there a while back, and I could just imagine how disappointing that was for you. Very cool about that recipe, too! That’s awesome how you were easily able to make it gluten-free. That can be a bit of a challenge for a certain recipes!